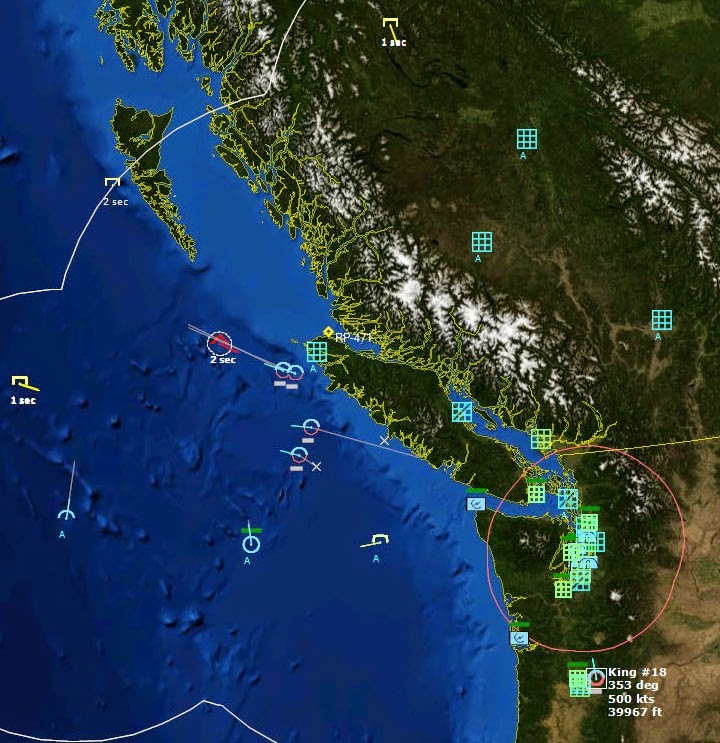 Deter, Detect, and Defend is a scenario for the fantastic wargame/simulation Command: Modern Air / Naval Operations, depicting a nuclear war scenario taking place in 1962, during the height of the cold war. Thanks to Christopher Comars aka Randomizer for creating this scenario for Command--it was a blast to play. Please forgive any mistakes I made in the AAR narrative that follows, as I am sure I have made gross errors about how things operate in the military, both organizationally and operationally. My desk is littered with reports, a copy of yesterday’s Seattle Times and this morning’s Seattle Post-Intelligencer. Since Sunday the media reports have become increasingly alarmist, but even so they are behind the curve. It's as if no one in the press expected tensions to rise this quickly, and skeptical that it could actually lead to anything serious. The day before, the Times’s story actually downplayed Khrushchev’s rhetoric, calling it nothing more than bluster. The press speculated it was all nothing more than saber-rattling, to remind the US that the Russians had not forgotten the Bay of Pigs. I know better. 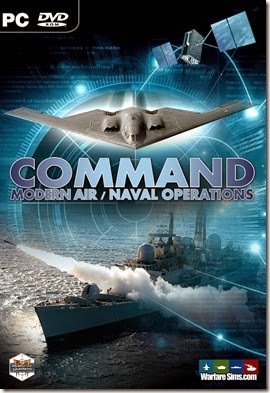 I am the commander of the 25th Air Division (SAGE), headquartered at McChord Air Force Base, Washington. My job is to defend the Pacific Northwest in case of World War III. I light another cigarette and exited my office, gratefully accepting a fresh cup of coffee from my steward. The Operations Center is already foggy from the smoke of dozens of chain-smoking technicians. Colonel Leary, my executive officer, stands talking with Captain Robinson, the Communications Officer. I catch his eye and give him a cursory nod, then sit in my command chair to watch the day unfold on the large screen at the front of the room. I hope it will be quiet. My Area of Responsibility (AOR) is the Pacific Northwest of the United States, to include the major populated areas of British Columbia. My counterpart in the Royal Canadian Air Force, Major General McAllister, is speaking quietly to a pair of his subordinates a few feet away, and his calm demeanor belies the state of controlled nervousness that pervades the Operations Center. Most of my command is still at a peacetime state of readiness, and that is worrisome. Better to get things rolling early to be safe. The radars are clear, and there has been no direction yet from NORAD, but things could escalate quickly. It would only be prudent to begin preparations now, and it is easier tell my command to stand down rather than speed things up if things go south fast. I call over Colonel Leary and give the order. He relays them to the various interceptors at the airbases under my command. Major General McAllister overhears and concurs, issuing his own orders to get the CF-101B Voodoo squadron at RCAF Comox on alert, arming and readying all aircraft. On the US side, interceptors at Paine AFB, McChord AFB, Portland AFB, and Kingsley AFB all go on alert, but it will be a worrying four hours before most are ready. While most of the aircraft are being readied, those already on alert are launched on patrols. 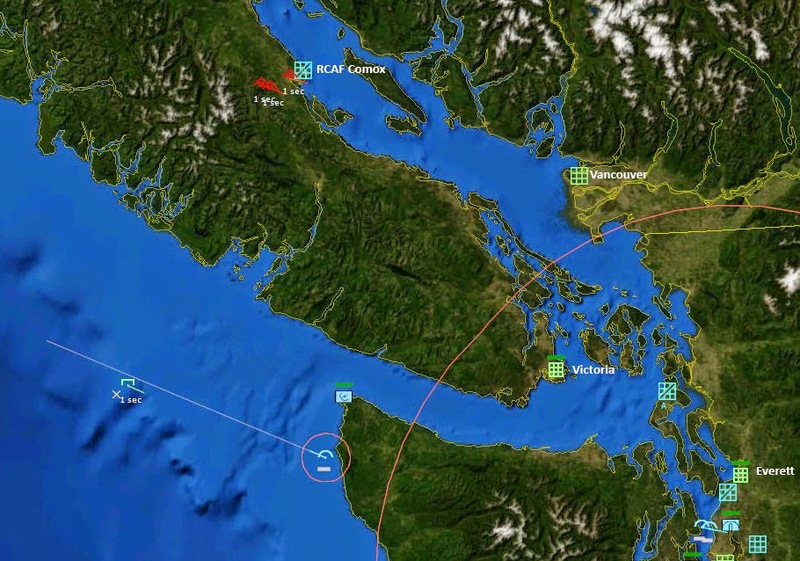 A pair of RCAF CF-101B Voodoos out of RCAF Comox on Vancouver Island are assigned to the north. Two F-106A Delta Darts, “Sixes,” from McChord AFB are launched to cover the westerly approach, while two F-102A Delta Daggers, “Deuces”, guard the middle. As an afterthought, I order Kingsley AFB to ferry some Voodoos to a more northerly airbase, figuring that Kingsley might be a bit too far removed from the action. The more fighters I have up north, the better. CF-101B from 409 All-Weather Interceptor Squadron, "The Nighthawks"
As the fighters taxi to the runways to begin their patrols, there is little else to do except watch and wait, and hope that the political situation will cool down. The secure teletype machine begins chattering away, and Captain Robinson scans the message as it is printed. He and Leary authenticate it, and then Leary brings it over to me. The look on the colonel's face says it all. 1. DEFCON 1 IN EFFECT FROM RECEIPT OF THIS MESSAGE. THREAT OF NUCLEAR ATTACK BY SOVIET FORCES CONSIDERED REAL AND IMMEDIATE. 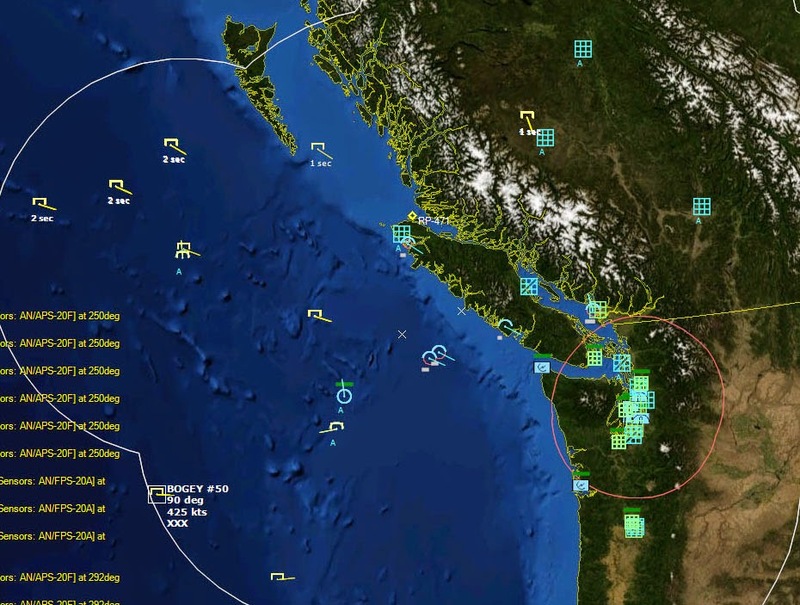 THE ASSESSMENT IS THAT NUCLEAR ARMED BOMBING FORCES ARE INBOUND FOR TARGETS IN THE PACIFIC NORTHWEST OF THE UNITED STATES AND PROBABLY CITIES IN CANADA. THE THREAT FROM BALLISTIC MISSILES IS UNKNOWN AT THIS TIME. 2. MISSION CONFIRMED. DEFEND MAJOR POPULATION CENTERS IN YOUR AO FROM SOVIET BOMBERS AND MISSILES. 3. RELEASE OF NUCLEAR WEAPONS IS REPEAT IS AUTHORIZED. EMCON STATUS AT YOUR DISCRETION. AIR DEFENSE WEAPONS FREE. 4. INITIAL SOVIET STRIKES AGAINST ALASKA AIR DEFENSE ZONE APPEAR TO HAVE BEEN SUCCESSFUL AND IT IS ASSESSED THAT MINIMAL ATTRITION OF INCOMING BOMBER FORCES MAY BE EXPECTED. MOST DEW LINE STATIONS ARE NO LONGER REPORTING FOR REASONS UNKNOWN. 5. 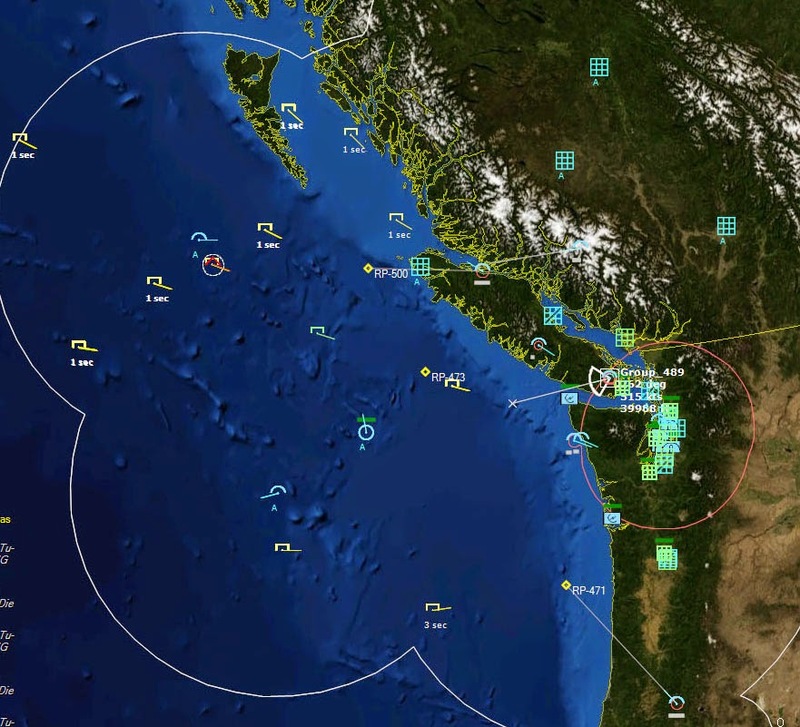 ARMY AIR DEFENSE MISSILE BATTERIES IN THE SEATTLE/PUGET SOUND AREA SUBORDINATED TO NORAD REGIONAL COMMAND UNDER PROVISIONS OF SAGE. HQ I CORPS IN FORT LEWIS HAS ASSUMED RESPONSIBILITY FOR CIVIL DEFENSE IN THE URBAN CENTERS OF WA AND OR. 6. HQ 13TH NAVAL DISTRICT WILL PROVIDE UPDATES AS NAVAL ASSETS PERMIT. 7. GOOD LUCK. CINC NORAD SENDS. Before I can fully digest this information, another one comes in, this time from the FAA. 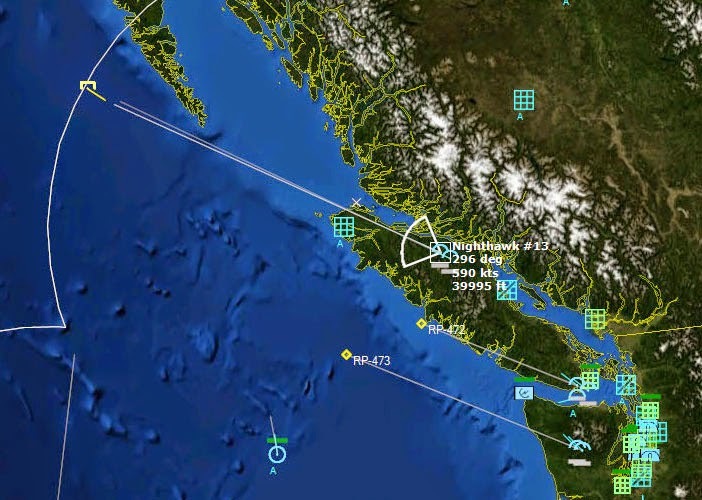 FAA advises that it is believed that a number of commercial aircraft will attempt to return to Canada/USA airspace under conditions of electronic silence during this crisis period. The national director of flight safety wishes to advise NORAD commands to use suitable caution when engaging unidentified aircraft. 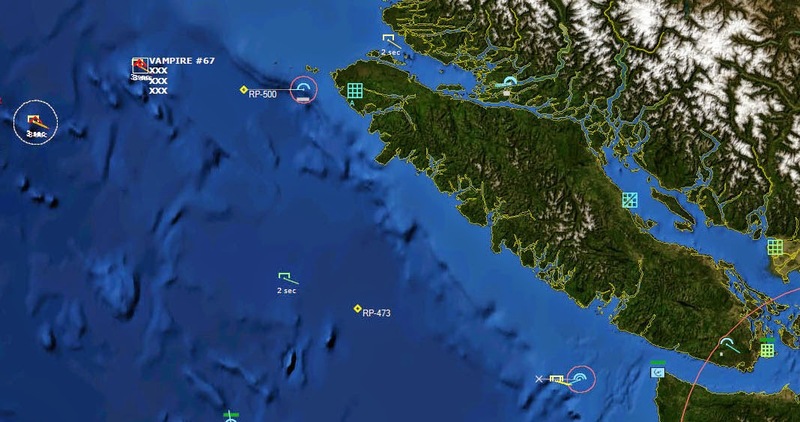 Radar Stations along the Pinetree Line will provide early warning of any inbound bombers, while a Navy EC-121K Warning Star patrols 400nm off the Washington coast on alert for any approaching bombers from the sea. The USS Kenneth D Bailey, a Gearing-class destroyer, maneuvers 200nm offshore to provide warning as well. 210944Z Contact. 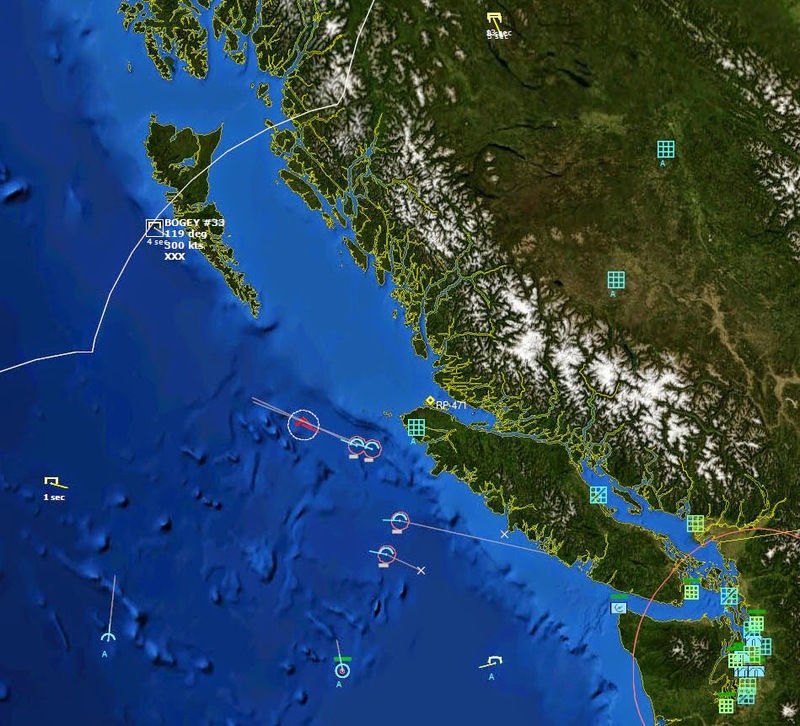 The Pinetree Line Radar Station RCAF Holberg detects three inbound bogeys, 230 nautical miles to its northwest. This is real, and it's beginning to hit me. I nod to Colonel Leary, and his Petty Officer relays the order to the interceptors. "Nighthawk Flight, Bigfoot, Warning Yellow. ID bogeys inbound, three-ship, Bullseye three-zero-niner for four-one-five miles. Vector two-niner-eight to intercept." "Bigfoot, Nighthawk Flight, wilco," came the the terse reply. High over Vancouver Island, the pair of brand new CF-101B Voodoos go to afterburner. Nighthawk Flight is tasked to intercept the inbound bogeys. 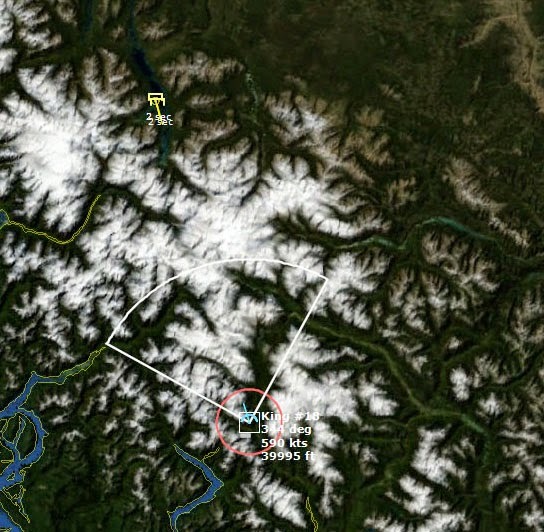 211511Z Another contact from RCAF Holberg. Three more bogeys, west of the original three. Red Flight, a pair of F-102A Delta Daggers from the 64th FIS, is tasked to intercept. Red Flight is vectored to intercept the new bogeys. 211916Z A new secure teletype from NORAD arrives. 1. SOVIET STRIKE CONFIRMED INBOUND FOR WEST COAST. 3. CONFIRMATION OF NUCLEAR DETONATIONS DETECTED IN EUROPE HAVE BEEN RECEIVED. 4. NCA CONFIRMS SAC EXECUTING SIOP. I am informed that B-52s are taking off from Fairchild AFB in eastern Washington, and Atlas missiles launches are reported near Spokane. I nod in acknowledgement, but don't think about it too much. Offensive operations are not my concern. Inbound bombers are. I pray there are no Soviet ICBMs on the way. The mood in the Operations Center is tense. I watch the display and light another cigarette. 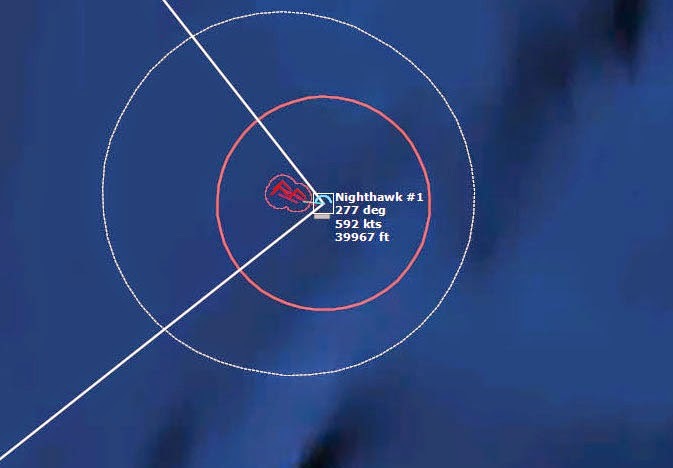 Nighthawk flight closes to within 100nm, at 1000kts closure. It won't be long now. 212618Z Three more bogeys detected, this time by Navy 5, the EC-121 Warning Star far out to sea. 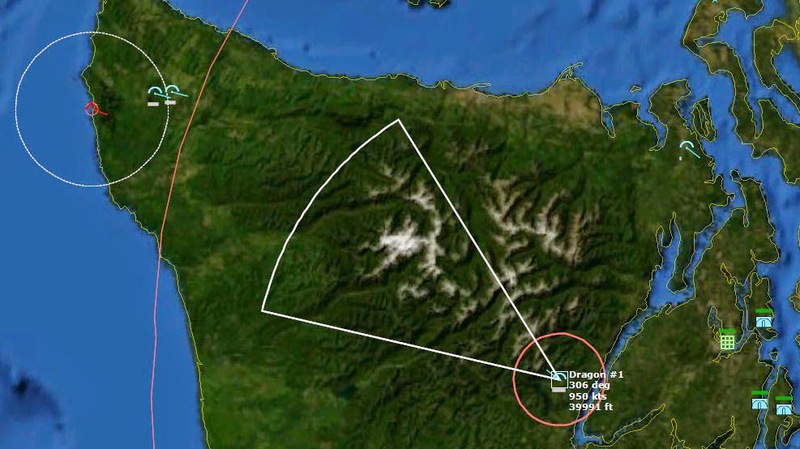 Dragon Flight, a pair of F-106A Delta Darts out of McChord, is tasked to intercept. 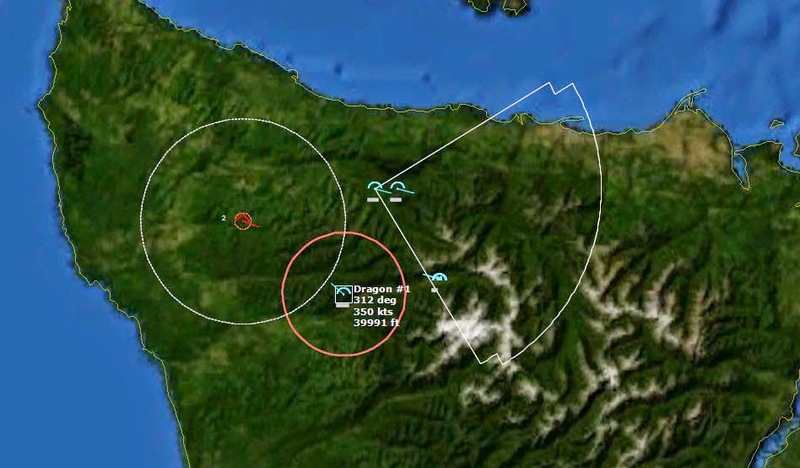 All of the airborne patrol flights now have targets. Defenses are saturated now, and still 33 minutes until the next flight of fighters will be ready for takeoff. 212804Z Nighthawk Flight closes to within weapons range, and I strain to hear the radio calls over the static. Nighthawk 13 identifies the incoming bogey as a Soviet bomber. Soviet Myasishchev M-4, aka 3M Bison-B bomber. On the scope I watched the CF-101B turn hard and maneuver behind the last Bison. “Fox Two! Miss, Fox Two! Fox Two again! Good kill, Splash Three!" Nighthawk 13 fires a AIM-4G Falcon at the Soviet Bison Bomber. Nobody in Operations smiles. This is just the beginning, so there is little reason to celebrate. However, Nighthawk 13 is clearly enthused. "Grandslam, Bigfoot! Nighthawk 13 is Tiger for Commit." "Nighthawk Flight, Bigfoot. Bogey is a three-ship, Bullseye three-zero-four for three-zero-three. Commit to vector two-four-zero for intercept. Positively ID before engaging," the communications officer replies, reminding the pilot not to get too eager and shoot before confirming that the bogey is hostile. "They're coming in dumb, sir," Colonel Leary observes as Nighthawk Flight moves to intercept the second group of three bogeys. "Flights of three-ships is practically telling us that they are bombers rather than civilians." 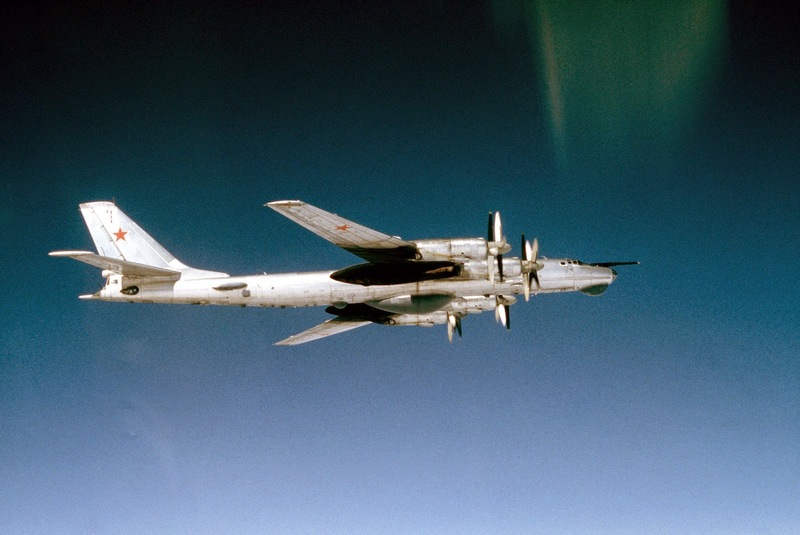 It was true--Intelligence theorized that Soviet bombers would make use of commercial airline routes to disguise their approach, and spreading out the bombers widely would make it more difficult for a limited number of defending fighters to intercept them all. The dispersal tactic was what the US planned for its own bombers, and it was expected that the Soviets would do the same. I shrugged. "All the more reason to look extra closely at any single-ships we see, to make sure they aren't trying to pull a fast one." 213123Z "Tally ho! Bogeys IDed as Blinder-As. Engaging." Tu-22B Blinder-As were supersonic bombers. There were not expected to be many of them in the Soviet Air Force, but any amount was bad. "Fox two!" Nighthawk 14 calls as it launches an AIM-4G Falcon. I listen intently as Nighthawk 14 calls off its missiles one at a time, hoping for a hit. Then, "13 is hit, 13 is hit!" Trailing the Blinders, the two Voodoos are vulnerable to the bombers' tail guns. A burst of static and just like that, both Nighthawks are off the air. My stomach flips as I imagine the crewmen, two to each Voodoo, plummeting 40,000 feet to the water below, if they are even still alive. General McAllister is stone-faced. Nighthawk 13 is shot down. 213229Z It’s up to Red Flight to intercept the Blinders, now 90nm away and closing at 1380kts. 213351Z Another flight of inbounds is detected, this time from the north. 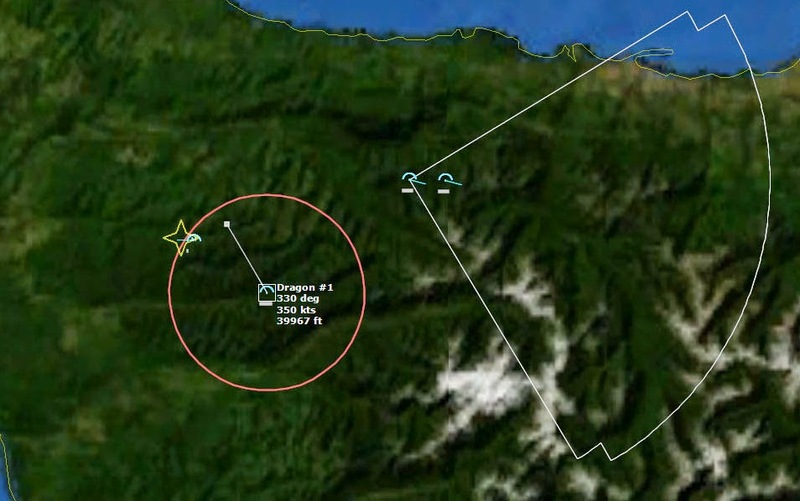 They are moving at 480kts, which suggests that they are more Tu-22s. 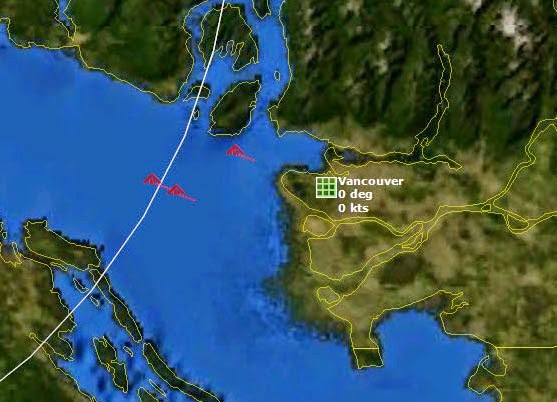 At 382nm from Vancouver, they could strike the city in 48 minutes. Red Flight and Dragon Flight have their hands full. The next fighters won’t be ready for 26 minutes, which should be enough time given the distance of the inbounds, but it is still a bit too close for comfort. But, there are a pair of F-101B Voodoos, King 17 and 18 out of Kingsley on a ferry mission to McChord, and fortunately they are fully armed. They should have enough fuel to make the intercept. I give the order. King Flight is ordered to intercept the Bogeys to the north. 213441Z Yet another bogey, designated Bogey 33, is detected. It is apparently a singleton, and is traveling at only 300kts. I suspect it is a commercial airliner. Either way, it will have to wait, as all the fighters are occupied. 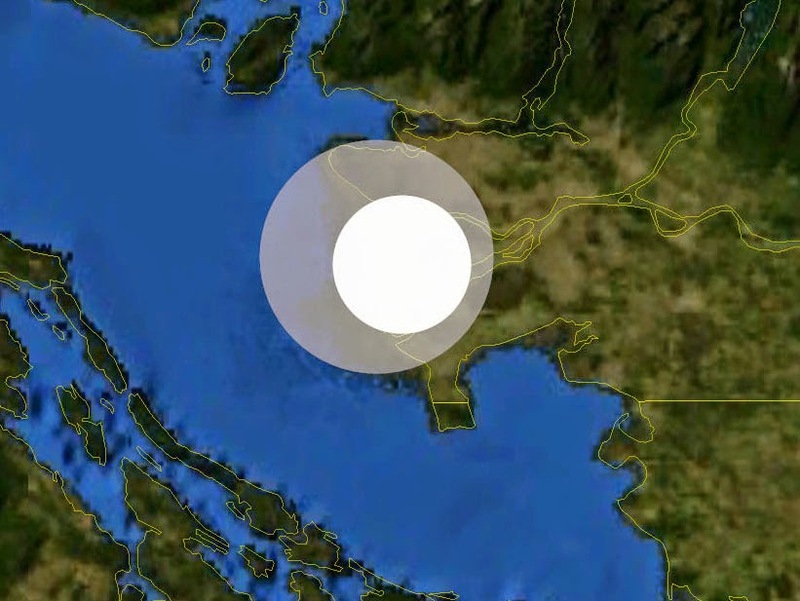 A possible civilian aircraft is detected to the northwest. 213555Z Red Flight begins its attack run on the Blinders. 213606Z "Fox One!" 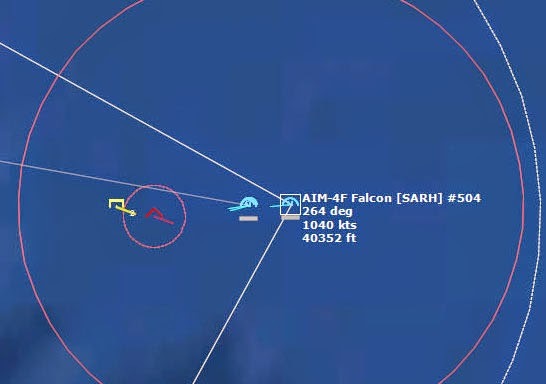 Red 11 fires a AIM-4F Falcon at the lead Blinder. "Fox One again! Fox One again!" 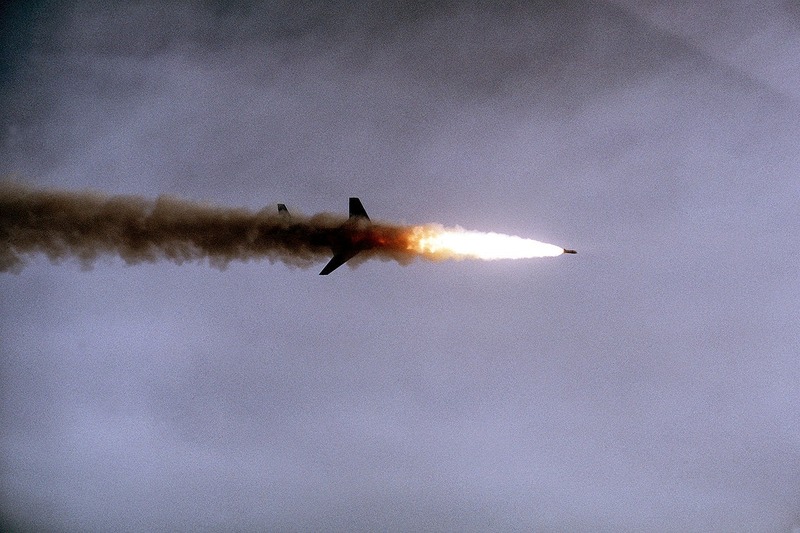 The third missile hits. Splash Four. 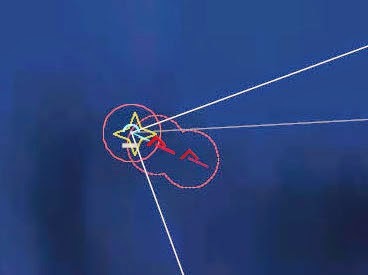 As I watch on the scope, Red 11 whips around and fires a trio of AIM-4Ds, while Red 12 fires a trio of AIM-4Fs. Red 11 scores another hit. Splash Five. Red 12 scores a hit. Splash Six. The second flight of bombers is destroyed. Red 11 is Winchester, and so goes RTB, while Red 12 is tasked to ID Bogey 33 and confirm that it is indeed a civilian airliner. 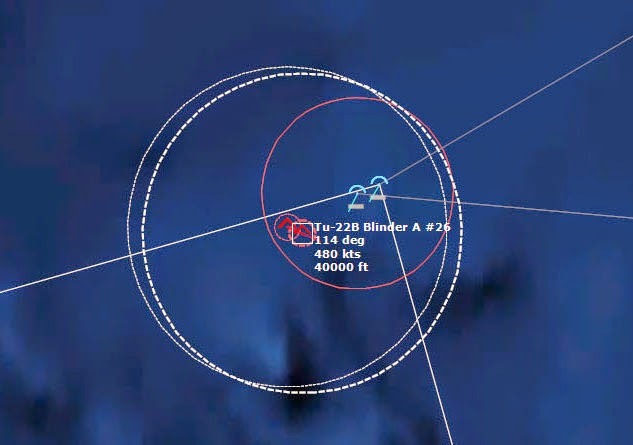 213958Z Bogey 38 is detected far to the west, and is moving at a disconcerting 510 kts. No fighter is available to intercept, so this contact will have to wait. Twenty minutes until the next fighters are ready. 214130Z Dragon Flight has reached Bingo fuel and is RTB, 115nm short of intercepting its target, and then Red 12 also is RTB due to Bingo fuel. I curse the oversight that let that happen. With such limited assets available every contact unidentified and every bomber undestroyed is a serious problem. Nineteen minutes until the next fighters are ready, so hopefully that will be enough. 214642Z Three more bogeys detected, moving at 395kts. Probably more bombers. 214742Z And then three more. The skies are getting crowded. Thirteen minutes until more fighters can launch. The skies fill with unidentifed contacts. 215218Z More contacts. A three-ship to the northwest--probably more Blinders. And a singleton to the west, moving at 520 kts. This is likely a civilian airliner, perhaps a Boeing 707, as it is unlikely that a Soviet Bomber would be on a vector that far south. There are now 18 Bogeys inbound, and only two fighters are currently available for an intercept. My officers exchange a few nervous looks, but I mask my fear. There is nothing that can be done until the next fighters are ready. Eight minutes until they can depart. 215545Z Three more Bogeys inbound. I am seriously concerned that my defenses will be overwhelmed. 215545Z Navy 5 IDs one of the inbounds as a civilian Douglas DC-8, and I mentally tick that one off the list. One fewer possible threat to identify. 215727Z Three more Bogeys inbound. Now there are 23 possible threats. 220000Z "Sir," says Colonel Leary. We have fourteen fighters now on the ramp, ready for takeoff, "Shall I order them to scramble?" "Negative. Launch only six, against these targets," I say, indicating the closest six inbound formations. "We'll hold the rest in reserve while the others get in closer. The last thing I want is for them to run out of fuel before an intercept." Every aircraft that returns with ordnance unexpended is a waste we can't afford. There are three hours before any more fighters will become available. These are all I have, and in three hours this could be all over. 220600Z Navy 5 identifies a group of bogeys as bombers, led by a Tu-95KD Bear B. I make a note and prepare to assign them to one of the new groups of fighters launching. 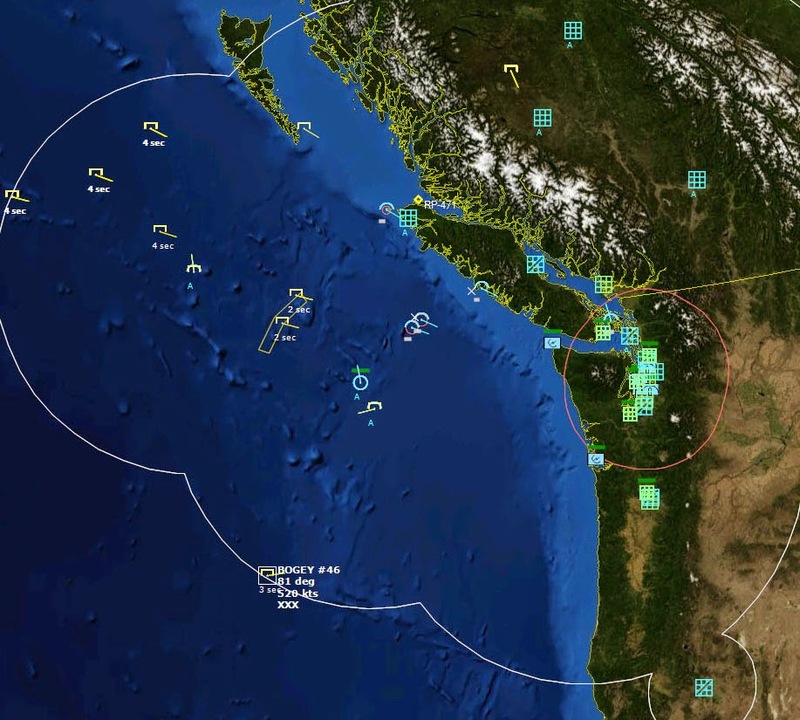 To the north, we watch the next intercept: King Flight against a three-ship over the Coast Mountains of British Columbia. King Flight prepares to intercept its target. 220915Z King Flight IDs the inbound bogeys as bombers, and 15 seconds later, as Tu-22B Blinder As. However, the F-101Bs of King Flight are not armed with AIM-4 Falcons, but rather AIR-2A Genies. Unguided rockets with a 1.5 kiloton nuclear warhead. Not very accurate, but they don't need to be. "Genie away!" comes the launch call as King 17 launches its first nuclear rocket. King 18 launches its own, and both rockets streak towards their target: the lead Blinder. Both nukes destroy the lead Blinder. King 17 and 18 close on the two remaining to engage with guns. They pass the bombers at high speed, then turn and fire a pair of AIM-4G Falcons, downing another remaining two Blinders. King Flight, Nighthawk 1, and Red 3 and 4 are all retasked to go after the closest threats. The fighters are tasked to go after the most pressing threats. 221736Z Bogey count is up to thirty-three. 221853Z Thirty-six. I just have to take them as they come, and keep my rising panic under control. Things can't get much worse, can they? 221939Z "Bigfoot, Navy 5. Vampire! Vampire! Three Vampires Bullseye 309 for 273 miles. Course 105 at 920 knots!" "What?" I blurt. Cruise missiles? Colonel Leary looks at me, similarly confused. "Find out what those are!" I nearly shout, rattled. Leary scurries away to where petty officers already have their reference binders out, flipping wildly through the pages. 222010Z Ashamed at my outburst, I try to compose myself, and hear Red Flight make their radio calls as they open fire on their target, a trio Tu-22B Blinder As. Red 3 and 4 fire missiles at the approaching Blinders. The attack is not as successful as hoped. Both Red 3 and 4 go Winchester, only having managed to destroy two of the three Blinders. "Scramble a Six from McChord," I order, and an F-106A Delta Dart, callsign Dragon 1, is in the air two minutes later. The Vampires appear to be on a course for Vancouver...what could they be? 222244Z Nighthawk 1 calls in, reporting the Vampires to definitely be guided weapons. I rack my brain, searching for an answer, but other events begin to distract me. 222337Z King Flight IDs an inbound as a civilian DC-6. They alter course to go after another one. 222559Z A Tu-22B Blinder A goes feet dry over Ozette Lake in Washington. 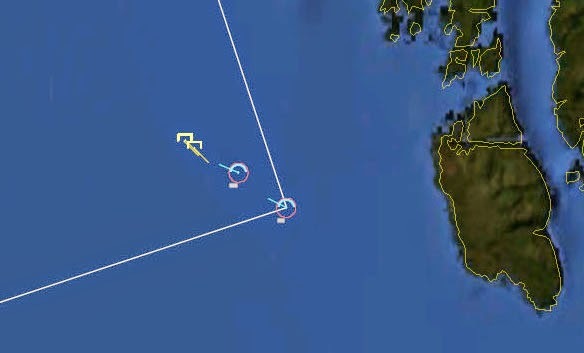 Red 3 and 4, both Winchester, follow it in, while Dragon 1 moves to intercept. The Tu-22B looks to be on a course for Bremerton. The Soviet nuclear bomber goes feet dry over American soil. 222657Z As the Blinder approaches within the The Nike Hercules SAM site S-92 launches a pair of MIM-14B Nike Hercules nuclear SAMs against the Blinder Tu-22B #37 at max range. 222828Z I order Dragon 1 cut its afterburner and loiter to see if the SAMs will take out the Tu-22B. If they fail, Dragon 1 will move into to finish the job. Dragon 1 loiters while the SAMs close in. 222855Z Splash Twelve. I breathe a sigh of relief as the SAMs take out the Blinder. 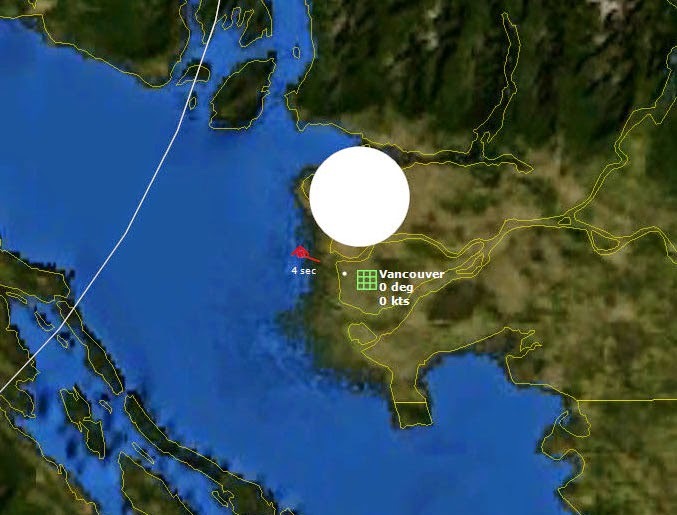 The bomber had approached within 66nm, or 8 minutes of Bremerton, Washington. I order Dragon 1 to intercept more bombers further out. The Blinder is destroyed by a nuclear SAM. 222902Z Two and a half hours until the bulk of the fighters will be ready for action, and there are thirty-three threatening-looking bogies inbound. 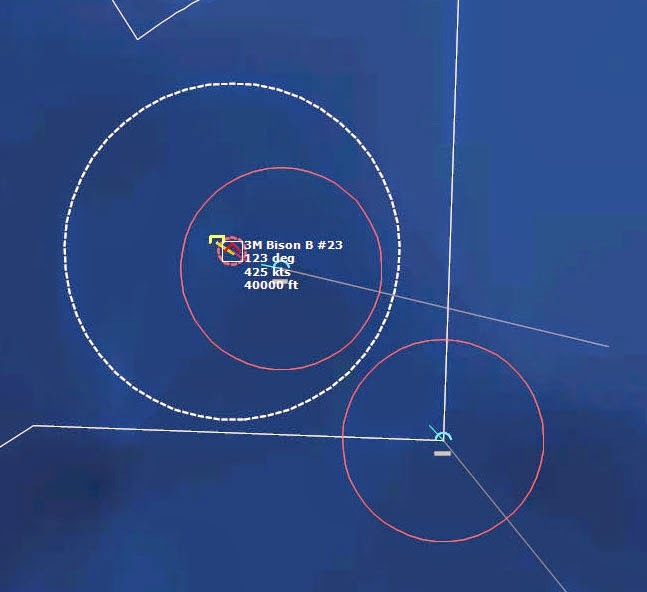 223014Z Nighthawk 1 engages three Tu-95KD Bear Bs. Nighthawk 1 engages a trio of Soviet Bombers. Nighthawk 1 manages to kill one of the Bears, but the other two are unscathed. Winchester, Nighthawk 1 must RTB. 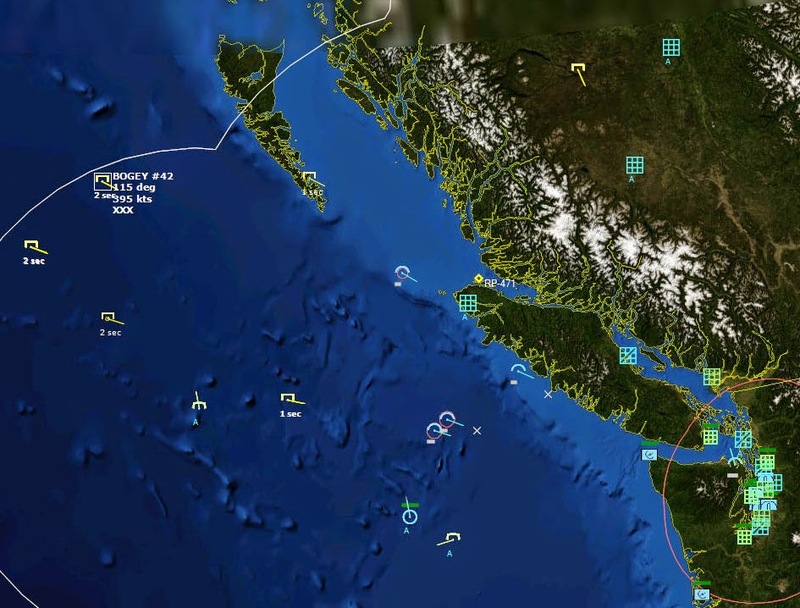 223116Z King 17 and 18 close with their targets off of Calvert Island, BC. 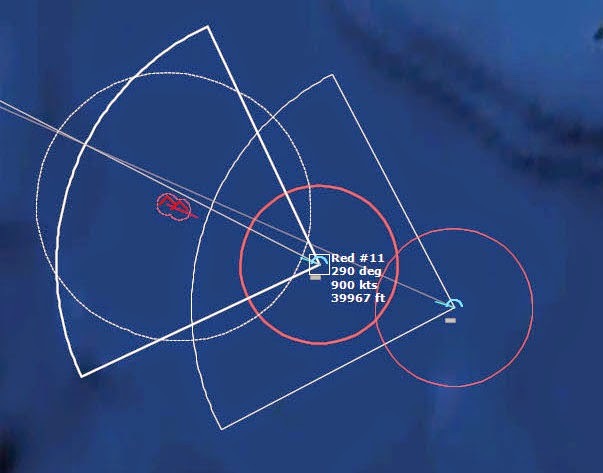 The targets are identified as Tu-95KD Bear Bs. The two fighters begin their gun runs on the bombers, and succeed in only destroying one of three. With so many inbounds, this kill rate is unacceptable. King Flight engages the Bears. 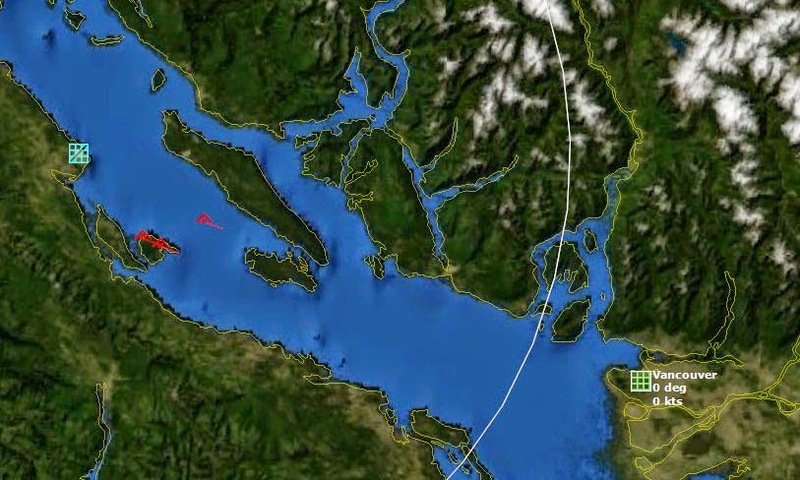 223436Z I watch on the screen as the three guided weapons--still unidentified--streak past RCAF Comox at 920kts at 59,000ft. I cringe as two more are launched by the Tu-95KD Bear Bs that Nighthawk 1 failed to stop. 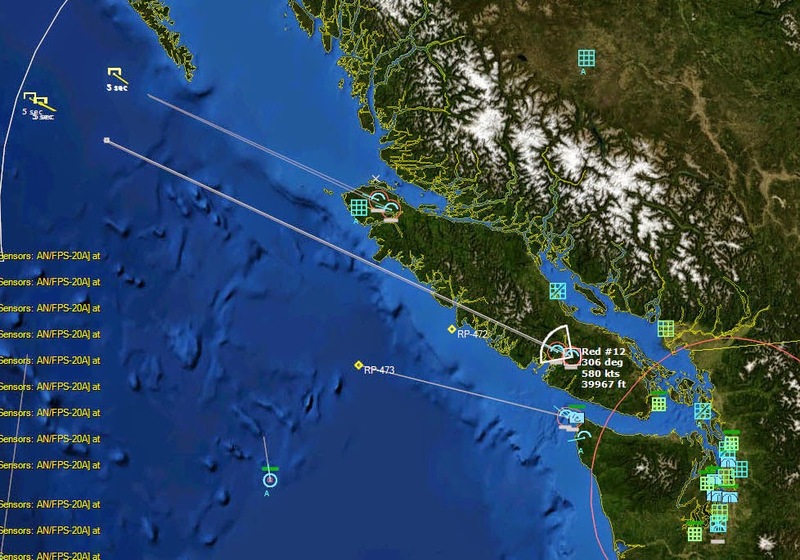 The three passing RCAF Comox appear to be heading towards Vancouver, and there’s nothing available to stop them. 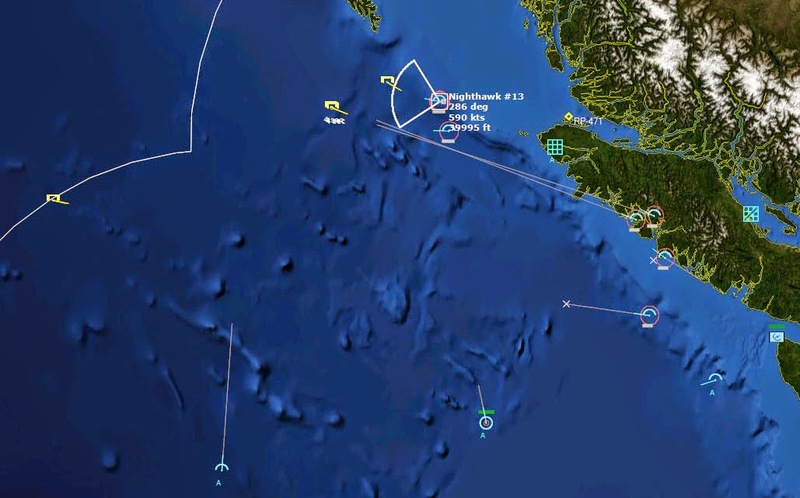 Three Vampires streak past RCAF Comox on the way to Vancouver. Colonel Leary rushes over, his face white as a sheet. "Sir, we've identified them. They're AS-3 Kangaroos. Nuclear cruise missiles. Maximum range 310 nautical miles, and a speed of 920kts. The vampires fit the profile." General McAllister's hands begin to shake. "Yield?" he asks. Leary hesitantly answers, "800 kilotons. Each." I stare at the plot, a cold fist clamping my throat. Vancouver is out of SAM range. There are no fighters even remotely close enough to intercept in time. At 59,000ft and 920kts, an intercept would be extremely difficult anyway. "Intelligence says that the Kangaroo is very inaccurate," Leary offers. "At 800 kilotons apiece, how accurate do you have to be?" McAllister snarls bitterly, his hands balled into fists. "I need to make some calls," he says, rushing off. Leary glances at the plot. "Less than five minutes." Three nuclear cruise missiles close in on a defenseless city. My eyes flicker away from the three missiles to the other inbound vampires. They appear to be moving towards the Seattle area. Seattle is protected by a tight network of Nike Hercules SAMs. A pair of SAMs took out a Tu-22 Blinder moving at 480kts easily enough, but can they handle cruise missiles moving at 920kts? I whisper a silent prayer. 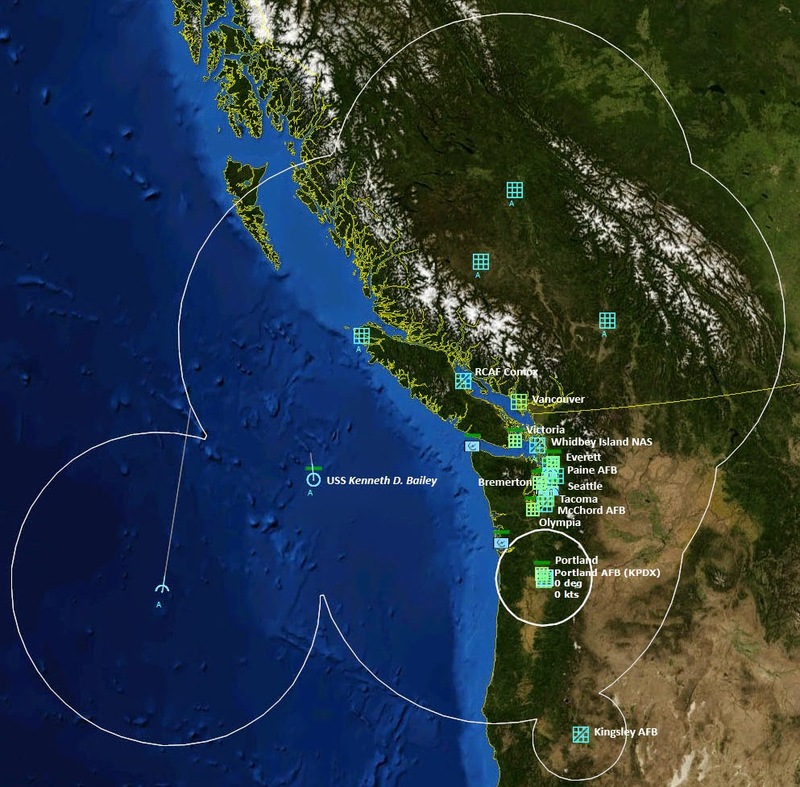 223625Z Navy 5 reports more missile launches, this time from just off Calvert Island. From their course, the likely target is Seattle. 223842Z All eyes are on the plot, watching with growing horror as the AS-3 Kangaroos streak in towards the beautiful Canadian city. "Looks like one for Vancouver, one for Richmond, and one for Vancouver International," Leary says in a dead monotone. "Looks like one for Vancouver, one for Richmond, and one for Vancouver International." 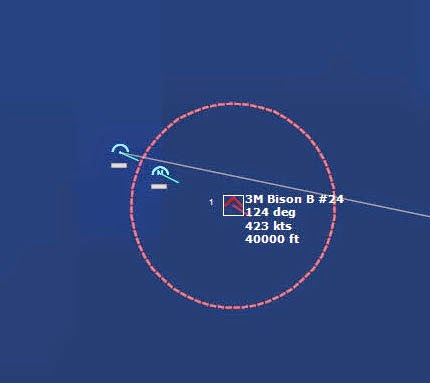 223915Z Off the coast of Oregon, King 7 and 8 engage a three-ship of 3M Bison Bs, destroying all three, but no one is paying attention. They’re all watching Vancouver. 223939Z Vancouver goes off the air. The control room is dead silent. “What is the population of Vancouver?” I ask, my voice barely above a whisper. An 800kt nuclear missile detonates over Vancouver, BC. 223958Z As the 800kt nuclear fireball expands, the second AS-3 strikes home in the nearby city of Richmond. It misses the airport by perhaps 2 miles...but that doesn't matter. 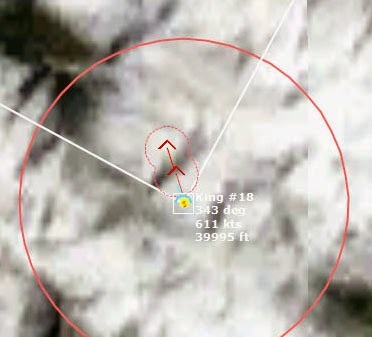 224009Z Within thirty seconds of detonation, the fireball has expanded to a diameter of 11nm. 224039Z Detonation plus 60 seconds. The other two fireballs continue to expand. There are probably more than a million casualties. The second and third nuclear missiles explode. I cannot begin to comprehend the enormity of what just happened, and that is a good thing. I must focus on the task at hand. There are four AS-3 Kangaroo nuclear missiles closing in fast on Seattle.